Ah, another day, and another wedding for Hog Roast Earls Colne to cater! Today’s nuptials were those of Olivia and Iain, who were tying the knot in a quaint countryside church local to Earls Colne. The reception was being held at a local farm that had been converted into a wedding venue with the old barn the location for our Hog Roast Earls Colne. We arrived on site first thing in the morning as we do at all our big events. It gives us time to get our machine set up and to get the meat onto roast early so that we can be confident it will have been cooking long enough to be perfectly succulent and full of taste come serve time. As we entered the barn we were stunned. The barn was covered head to toe in lanterns, flowers and even hand carved decorations- it was a beautiful setting for a wedding reception. A touch we particularly enjoyed was the fact that every table had been named after an animal, seen as we were on a farmyard after all! We quickly got the meats cooking, a couple of legs of lamb, a side of beef and of course a whole hog that we would be spit roasting whole. With the meat taken care of, the next job is the accompaniments. Today we would be serving some seasonal roasted vegetables, corn on the cobb and a selection of freshly cut salads. Olivia had asked us to also bring along a vegetarian option and so our Hog Roast Earls Colne chef had prepared his delicious homemade vegetable tart which is sure to entice even the meat eaters! With that we were all set! 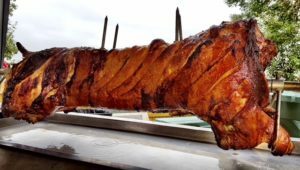 We were eagerly awaiting the arrival of the bride and groom to congratulate them and to give them the first helping of our Hog Roast Earls Colne! Another wedding for Hog Roast Billericay!